The Calla Karate Martial Arts and Child Development Programs are designed to enable students to develop into well rounded young individuals with self-esteem, confidence and respect. Our Adult program consists of adults only! Students ages 18 and above! This class offers so many benefits in one “strong” program! Socialization, weight control, focus and attention and discipline – an outstanding program for outstanding children! Calla Ninja Warrior fitness brings to life challenging obstacles that will increase overall strength, aide in balance and coordination, provide great cardio benefits and most importantly help fight obesity. CALLA KARATE – EMPOWERING STUDENTS TO BE THE BEST THEY CAN BE!!!! 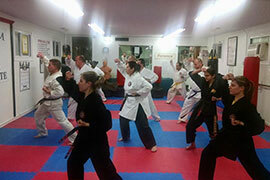 Calla Karate is a family owned and operated dojo on Staten Island. We have designed our school to provide a warm and inviting atmosphere. We believe that when you walk in the door – there will be no doubt that this is the school for you! A husband and wife team that understand the importance of ethics and values and being parents we understand the need for trust and compassion. 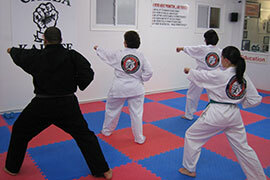 To provide the finest instruction in the mental, physical & character building aspects of the martial arts. To provide the best professional facilities in the area. To create an environment that gives each individual the opportunity to pursue and achieve a greater level of success and freedom. Kyoshi Eddie Calla brings his extensive traditional martial arts training in Goju Ryu and Japanese JuJutsu to modern society. Being taught by the great Grand Master Peter Siringano, Sr. and Sensei’s Alan & Glenn Nieves, Kyoshi Eddie is able to pass down his extensive knowledge of the arts to his instructors and students. It is our goal to create a safe, nurturing environment that is welcoming to every student. Our classes are innovative, enjoyable and effective! Building self-esteem, confidence, physical and emotional well being is a priority. Sensei Mary Calla and the Calla Karate Instructor team continue their physical and academic training which enables us to provide you with the utmost learning experience! With over 30 years of martial arts experience we are able to offer the highest level of Karate and JuJutsu instruction available on Staten Island. Calla Karate is a wonderful place. Great owners. Great instructors. Great kids. It is a true community of families. Also a great place if you have children with special needs. A great friendly environment for my son who loves the class and looks forward to going weekly. True Martial Arts teaching children self confidence, respect for others and discipline. Best on the Island!! !